All transactions are safe and secure with a reliable history in online purchasing behind each of our associates. Buy the Drayton Sawyer Chili Champ t-shirt to own Texas Chainsaw Massacre clothing and merchandise. 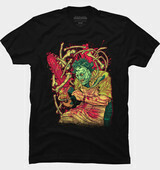 This Drayton Sawyer shirt is a fun alternative to a Leatherface t-shirt. Wear it as you watch the original movie or any of the sequels, including The Texas Chainsaw Massacre: The Beginning. The design on the front celebrates Drayton as the Chili Cook-Off Grand Champion 2 years in a row. As the design states, "The secret's in the meat!" We're guessing that his brother with the chainsaw helped to tenderize it. Wear this Drayton "The Cook" Sawyer tee with your Texas Chainsaw Massacre costume or TCM hat. In addition to the Drayton Sawyer Chili Champ tee above, browse the Texas Chainsaw Massacre Clothing Gallery for more apparel like men's and women's clothes, kids shirts or hoodies.